Salinity in the lower Hudson River and other NYC waterways, 3/21/11. Ocean salinity is ~35 (red), freshwater is 0 (purple). An estuary is defined as a semi-enclosed body of brackish water – a mixture of salty and fresh water. So strictly speaking, the Hudson by Manhattan and northward past the Tappan Zee is normally an estuary and typically has more ocean water than river water in the mix. Brackish water can actually work its way about 70 miles north of NYC to Poughkeepsie in droughts. But this week, things are different. Due to the melting of this winter’s heavy snows and also recent rains, the springtime freshwater flood in the Hudson — the freshet — is fairly large. 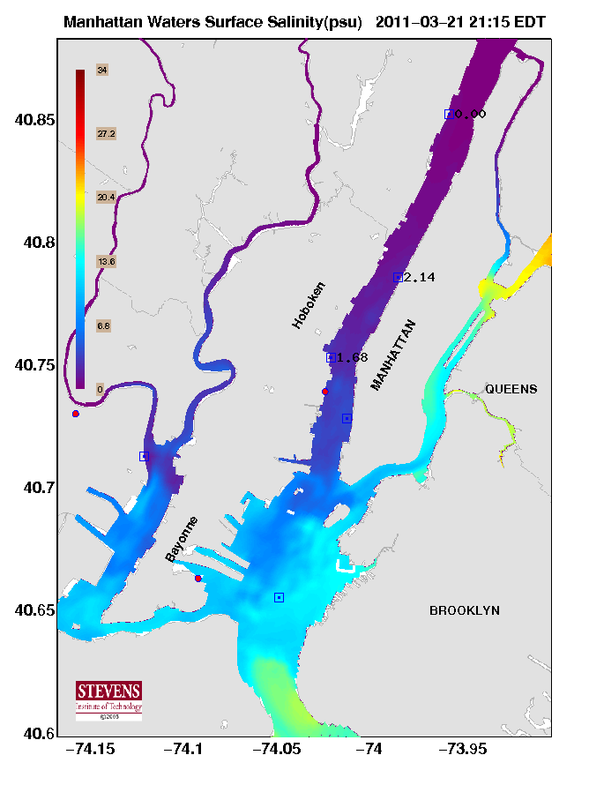 An interesting result of this and to a lesser extent the supermoon spring tide is that salt water is being pushed out to sea with a rarely seen ferocity and the Hudson is actually a RIVER along nearly all of its length, running freshwater at all depths all the way to the northern part of Manhattan. Freshwater floats over saltier (denser) water, and the surface waters could actually be fresh all the way to New York Harbor after ebb tides. USGS has a nice webpage for checking the estimated location of the salt front, or to see a detailed map similar to that above with the latest salinity observations and predictions, check NYHOPS. Mind you, salt transport is a different thing than wave transport, which doesn’t require molecules to go along for the ride — the tide is a long-period wave and travels all the way up to the dam at Albany, and the Native Americans referred to the Hudson as the river that runs both ways because of the reversing tidal currents. This entry was posted in water and tagged estuary, freshet, Hudson River, Manhattan, spring tide, supermoon. Bookmark the permalink. * the oligohaline part of the system has very low salinity, 0.5-5 parts per thousand (ppt), relative to 35 ppt for typical seawater.